Priori connects entrepreneurs and businesses with a network of quality, vetted attorneys at their most competitive rates. As of November 2017, we're the first streamlined legal partner in the WeWork Services Store, offering WeWork members easy access to Priori’s online platform to find and hire attorneys from our vetted network at an exclusive discount available only for WeWork members. Launched in April 2017, the WeWork Services Store is a one-stop shop for WeWork members to browse and purchase various business services. WeWork has partnered with top service providers like Slack, Amazon Web Services and Xero to offer its more than 100,000 members discounts on the tools and services they need to grow their businesses in a variety of areas, including productivity, sales and marketing, HR, finance, and of course, legal. As the first Streamlined legal partner, Priori has integrated with the Services Store to allow WeWork members to sign up and hire a lawyer for any legal project directly from the Services Store. WeWork members will receive an additional 10% off the already-discounted rates offered by attorneys on the Priori platform and a $200 credit after their first $400 spent, with all project fees being included in their WeWork invoice for that month. With our deep network of expert attorneys, Priori has helped thousands of businesses and corporate legal departments find, hire and manage excellent outside counsel at their most competitive rates, and we’re excited to drive the same value for WeWork members nationwide. 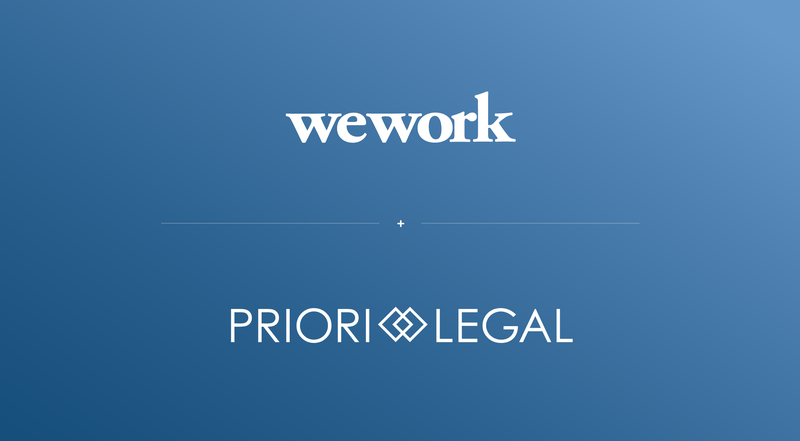 If you have any questions about Priori Legal or our new partnership with WeWork, please don’t hesitate to email us at hello@priorilegal.com. Parsa is Priori's Head of Business Development and Market Strategy.